In the software community, the Open Source movement encourages sharing software freely. Whether it’s “free of charge” (one type of freedom) or “free to use these materials and modify in any way you wish” (a different type of freedom altogether), these people share the work they’ve done and the rights to use their work with the larger community. In the education community, too, there is a long history of teachers sharing resources with each other. From worksheets to lessons plans, from presentations to assessments, we have all benefitted from the experiences and work of our peers at one time or another. In my own teaching career I have moved from being a borrower of others’ materials to a creator of my own. Computer programming assignments from Cindi Mitchell, physics lesson plans from Dennis Wittwer, Don Hubbard, and Carol Wawrukiewicz, and pedagogical strategies from Aaron Glimme have all informed what I teach and how I teach. A few years into my career I began developing the confidence to share my own growing expertise with others, and learning how to publish my own materials on the World Wide Web was a turning point. Since then, I’ve been happy to share much of what I do professionally on my course websites, even as my own practice continues to evolve. 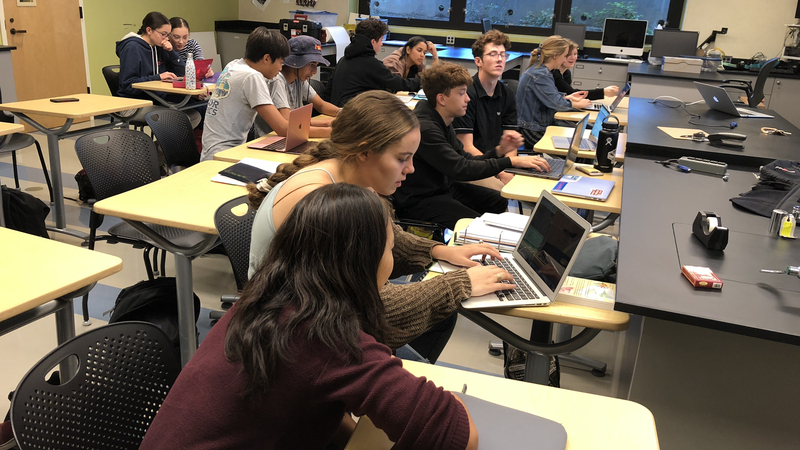 For a number of years now, teachers at Poly have been using the school’s internal website, MyPoly, to help organize and manage resources for their students. Some teachers also maintain public-facing websites where that information is available to others outside our community. (See Greg Feldmeth and Craig Fletcher” for examples.) These websites typically don’t share everything a teacher does—test keys and personal student information wouldn’t be appropriate for posting-—but assignments, practice materials, and even homework solutions might be found. I’m teaching AP Physics 1 for the first time at Crescent Valley High School, in Corvallis, Oregon. I came across your website while searching for materials to use for a pre-assessment. Would it be all right with you if I include some of your questions in the document I give to my students? I’d be happy to return the favor at some point if it’s ever useful. Thanks in advance and I hope the new year is treating you well. Occasionally a student will write asking for assistance of one kind or another. I received one such request from a student in Maryland just after the Thanksgiving Holiday in November, 2018. My name is Zeke Nohr, a senior at Aberdeen High School. Over the brief Thanksgiving break, our physics teacher resigned very unexpectedly. The school in the process of finding a replacement for him but as of now, me and 5 other seniors who are very skilled and interested in physics have been placed in charge of planning the curriculum for his physics classes. Two of the classes are AP Physics C: Mechanics which we all took last year so we have all the resources we need for that. The other two are AP Physics C: E & M which we are currently enrolled in. We have some resources that our teacher left behind but we are missing practice tests we would like to use as review materials, especially since we plan on having our next test on Monday or Wednesday next week. Our previous physics teacher frequently used the “Multiple-Choice Practice Problems” from your website, learnapphysics.com, that are displayed with all units. I do not see a way to download these as a document to distributed to our class. If you have those documents available for the Electricity and Magnetism Units, we would be extremely grateful if you could provide us with a copy. I replied, with instructions on how the student could access some of those problems, and provided links to some practice tests that I post online for students, and got a quick reply. Thank you so much for taking time to respond to my email and providing me and my fellow students with resources we can use for the rest of the year in our physics class. We are extremely grateful for your help during this transition. When I shared the story with Craig Fletcher, he thought that he might have some materials that the students would benefit from as well. In a separate email, he sent along his own set of links. Hello, this is Zeke Nohr from Aberdeen High School. I sent you an email around the end of November asking for practice tests resources for our physics classes that me and two other students were teaching due to the unexpected departure of our physics teacher. Mr. White first sent me some great practice tests which were extremely helpful and we are all very thankful for your generosity. When Mr. Fletcher sent me the email saying the two of you had discussed it and shared the plethora of resources on your website, including lectures, textbook links, practice tests, and homework problems and solutions, we were all surprised and excited by your generosity and willingness to help us through a difficult time. Luckily, a new physics teacher was found very quickly and he started here on Monday. His name is Viktor Polyak and he recently graduated from college and this is his first time teaching. He is very good at explaining the topics and all of us here at the school like him. Since he is a first time teacher, he didn’t have any teaching resources when he came in so we have been using the lectures that the two of you supplied and they have been so informative and helpful to us (the mechanics classes have especially enjoyed “The Island Series” at the beginning of Mr. Fletcher’s lectures) and we intend to keep using them for the rest of the year. Having these resources has made the transition to a new teacher so much easier as he does not have to spend time looking for lectures and homework problems and can focus on helping us learn. We are all extremely grateful to the two of you for sharing your resources with us in a time when we did not have access to any. Your generosity and compassion is heartwarming and has made a huge impact on us here. I told the other students here that I was sending a thank you email today and some of them wanted to sign the email as well to show their gratitude. The email was signed with the names of 42 students, the school’s program director, and the new physics instructor, Victor Polyak. Teachers at Polytechnic School find lots of ways to become involved in our community of learning. We are involved with consortiums and cohort groups, we attend workshops and conferences, we teach at summer school or Partnership for Success!, and we work with teaching fellows and mentor new teachers. For me, making course materials I’ve developed available online where they can serendipitously benefit students and teachers in an even broader community has been a rewarding part of my professional life. If you teach Computer Science, chances are that learning about the binary numbering system is part of the curriculum at some point. Those multiple layers of abstraction / encapsulation are very much a part of computer science, and a perfect jumping off point for a conversation about binary numbers. Students should understand that binary numbers are at the heart of every computer. A great video for demonstrating how people used to have to program computers is this one, demonstrating the programming of an old 8080 microcomputer. Follow that up with a demo of high-level / assembly / binary version of a program, described here. 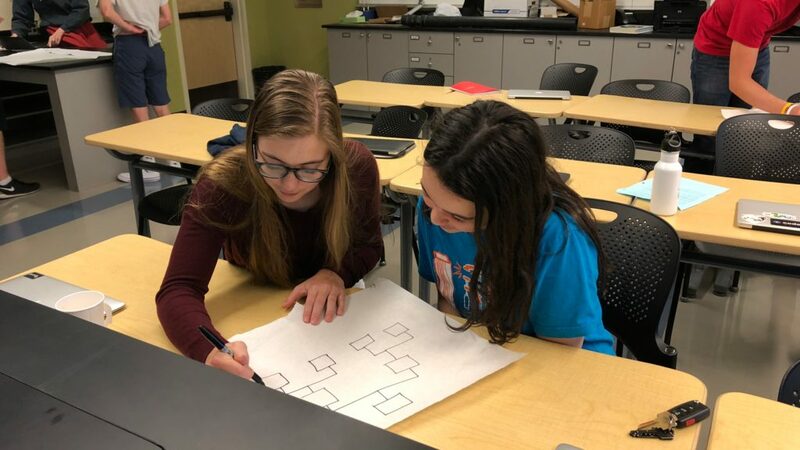 Learning how to decipher a binary number is not that difficult, and provides students with a manageable gateway activity to the field of computer science. 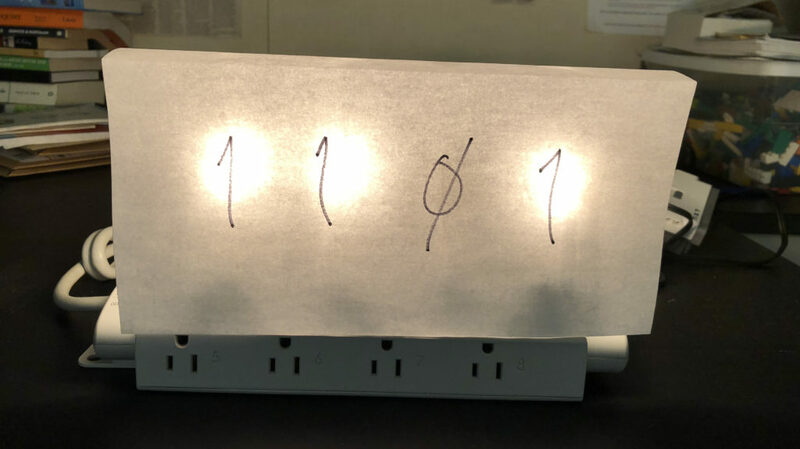 A more visible and physical demonstration of binary numbers can easily be constructed using an outlet power strip, socket adapters, and low-wattage aquarium light bulbs (see parts list below). This device can be easily manipulated at the front of the room, with individual bulbs easily turned on or off simply by screwing them in tightly (on), or unscrewing them slightly (off). 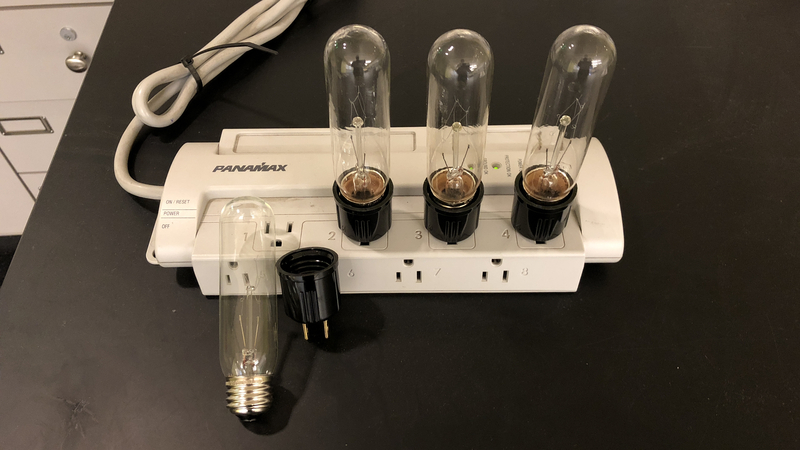 Students can be asked to identify the decimal equivalent of a binary number, or asked to manipulate the bulbs themselves to produce the binary equivalent of a decimal number. This inexpensive and physical, practical demonstration device can be used in the classroom, with parents, during open house events, etc. It has become a mainstay of every CS course I teach. As the new school year begins my classes are filled again with students, all of them wanting to learn, to improve their understanding of the world, and to develop their skills in a wide variety of areas, from writing essays to shooting free throws to writing computer programs to understanding human history. Some of them, as part of their desire to improve, also wish to be “the best”in one or more of these areas. Just to be clear, that’s not something that you get to be, and it’s not healthy to have such a notion even on your radar. Of course it is *technically* possible to be “the best” at some arbitrarily-defined objective, in some subset of the population. I might be the best physics person in my household, for example, or my friend might be the best miniature golf player. There is a student I have worked with who is the fastest cross-country runner our school has ever had, and he has certainly developed some of his skills in healthy competition with other students. He continues to develop as a runner in college now, but he doesn’t have any expectation that he’s going to someday be the fastest cross-country runner *in the world*. The pursuit of such a goal would be, for him, distracting from the other opportunities he has in his life, and ultimately fruitless. 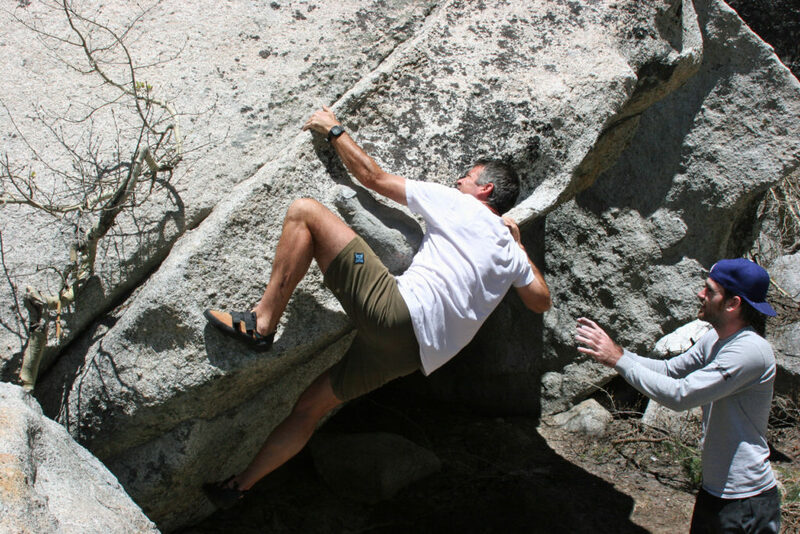 In an interesting subculture of rock-climbing called “bouldering,” short climbs of subjective difficulty on a natural crag of rock or in a climbing gym are attempted by climbers wishing to improve their skills. A rating system grades these climbs–these “problems”–by difficulty from VB (a very easy climb, equivalent to scaling a ladder almost) to V0, V1, V2, and so on, up to (currently) V15, a problem so challenging that only a very few are able to pull them off after repeated attempts. One of the wonderful things about bouldering is that there is naturally a focus on improving one’s skill level–“I just succeeded on a V3, I wonder if I can do a V4?”–in a supportive environment, with other climbers offering words of encouragement and, in some cases, spotting the climber to offer safety in the event of a fall. If there’s any competition, it’s a friendly one, perhaps to be the first to accomplish a given problem. There’s not much room for the idea of being “the best” when there’s a problem one crag over that’s twice as hard as what you’ve just completed. In my teaching I have the pleasure of teaching physics to very bright students, it’s my role to offer them a sequence of problems which present them with increasingly difficult challenges of their understanding of physics principles. Students who recognize that they have started along a path towards a greater comprehension are able to approach their learning with a more relaxed attitude, and seem to be more receptive to the inevitable setbacks that are a normal part of that process. One of my students, after getting what she felt was a disappointing score on a physics test, went home to tell her father about it, hoping to get a little sympathy from him. His support, however, wasn’t what she expected. Upon hearing the news he just smiled, put an arm around her, and said, “Now you know you’re studying *real* physics!” He was an engineer, and all too familiar with the struggle that comes with making progress in any challenging endeavor. The whole idea of “life-long learning”—which every teacher I know has whole-heartedly acknowledged and embraced—is not something that some students have internalized yet. But it’s true, and it’s something that high-school students seem to sometimes struggle with, and the brighter the student, the greater the struggle. Accustomed to lapping up the easier challenges of the Lower and Middle School year, an Upper School student may be faced with something that is truly beyond their quick-and-easy mastery for the very first time. It’s a great opportunity for students to come face-to-face with the academic (and personal?) challenges that they will encounter throughout the rest of their lives. Helping to manage their expectations at these moments is an important part of our teaching job. Some days are better than others… and April 5 was a pretty good day for me at work. Today was a Day 2, which means I get to see all of my students: AP Physics, and later on in the day AP Computer Science, followed by Advanced Topics. It was already going to be a good day—a bit of lecture, followed by a fun lab activity—and just as I was getting going, I received a FaceTime call on my phone. I apologized to the students for the interruption, looked down to see who was calling, and didn’t recognize the 626 number. “Is one of you all pranking me?” I asked the class. I’d given my number out to all of them earlier in the week as an emergency contact for our field trip to Six Flags Magic Mountain. I answered the call, and the face of Turner, a student in that class who was out sick for the day, appeared on the screen. I launched the app, got the screen pointed toward the board I was developing on, and a few minutes later Turner was following along from home, just as if this was something that we do every day. Then it was time for our lab. Students were arranging magnets in various configurations, placing a clear piece of plastic over them, and sprinkling iron filings on the plastic in order to discover what the magnetic fields around those magnets looked like. 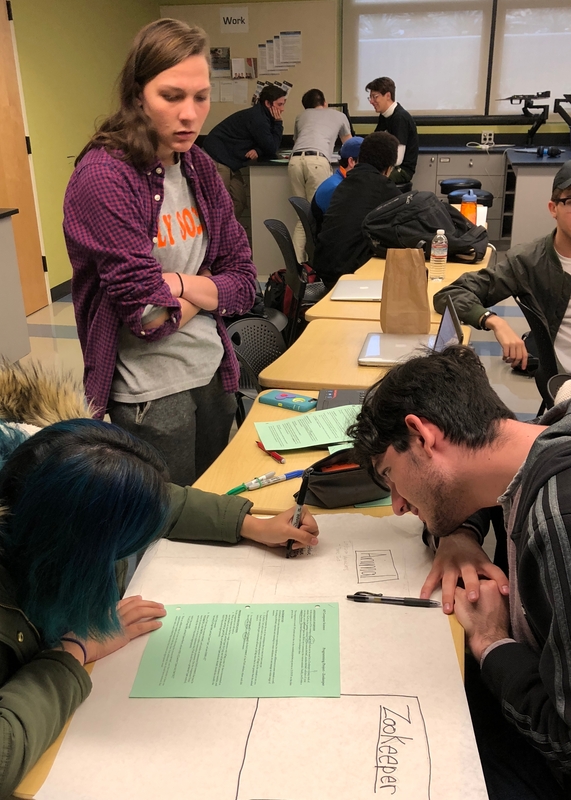 One of the students in class, Nick, kindly volunteered to work with Turner, and for the next 30 minutes or so, there they were, looking at the magnetic field effects, making drawings, and discussing whether or not what they’d observed made sense, just as if she was in class. 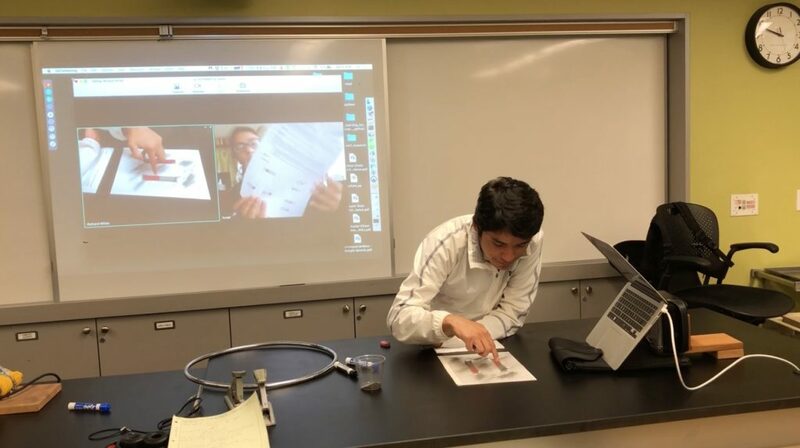 When people talk about distance-learning, they’re often talking about a model in which a student watches a video lecture, and then maybe “interacts” with other students by leaving a few messages on an online discussion board. It doesn’t sound like a very robust way to teach/learn, and I think most people I know have a natural (and perhaps well-founded) distrust of the experience offered by taking an online class. What I loved about my experience with Turner this morning was the natural way that the distance-experience occurred within the context of our regular class. And the fact that she was interacting with her teacher and peers in real-time was cool, too. This isn’t something that can scale. This isn’t an experience that anybody is going to be able to monetize in any real way (I don’t think). But it was awesome, and a great way to start my teaching day! The AP Computer Science this year is overfilled, and the difference in the ability level of students varies pretty widely. The “Goldilocks” experience in there that’s just right for most students will be too easy for the more capable students, and require significant support for the students who are still coming along. Today, as students were still struggling to recover from ten days off for Spring Break, I was trying to bring to a close our conversations around Sorting algorithms, recursion, Big-O notation. The Merge Sort was the topic for the day… and I wasn’t looking forward to it. In the past I’d given them a template for this algorithm and had them try to fill in the missing pieces, or in tough years I’d forego this particular algorithm altogether. Today, I was having none of that. Today, I’d decided, I was going to develop it with them in class, step-by-painful step. It worked fantastically. 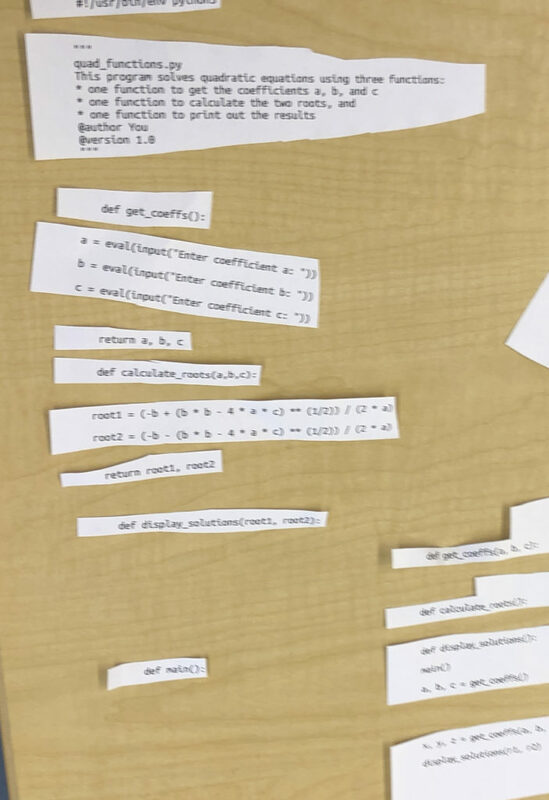 After a few moments settling into class—one student wanted to show me the new Tiger Woods video and update me on the current scores in the Masters—I grabbed a marker and took them through a quick review of the Merge Sort process itself. And then I was writing a bit of code for the first part of the sorting process. I targeted specific students with specific questions, and everybody was keeping up, more or less. I left the room at one point to let them work on their own for a bit, typing what we’d developed by hand into the computer. I came back to develop the tail end of that sort process… and then we were in to the business: the merge method that would pull each pair of recursive arrays back together. For just a moment there, I felt like a real teacher. And following directly on the heels of that was the class for which I’d attempted to flesh out the Elevator Project, and more or less failed. I’d decided earlier in the day to re-frame it as an open-ended project. A few days before I’d had students fill out a Course Evaluation form and the results of that, while generally positive, also suggested that there was room to push the students a bit more. 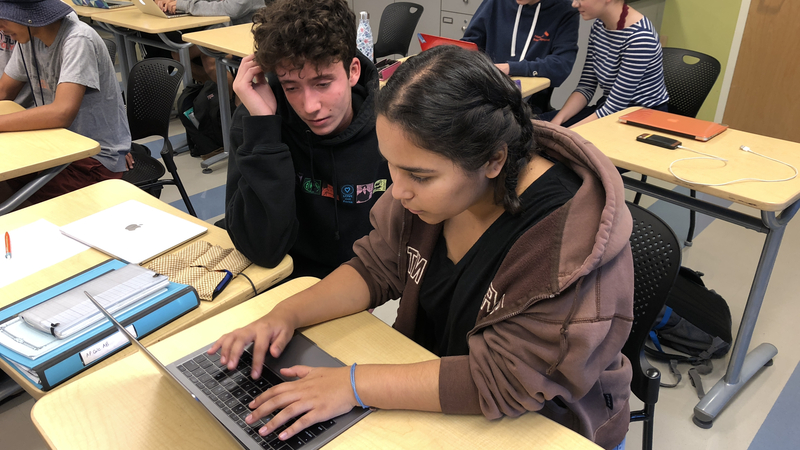 An open-ended project that gave students a bit more latitude to explore, fall down, and ultimately (one hopes) succeed might be just the thing. I had typed up a brief two-page handout with a general description of the project: they needed to write a class-based simulation of a Hotel with a single Elevator that would move up and down between floors, picking up each Passenger from their current floor and delivering them to a requested floor. I passed out the blue photocopy of the assignment while explaining the general idea, and pointed out that this was a classic introductory Computer Science assignment and that I’d be working on my own version of the project at the same time they were. And next thing you know, there is me along with thirteen Advanced Topics students crammed into the three-story elevator of the Poly building, traveling up and down. Ah, my little Computer Geeks. We got off the elevator a few minutes later and returned to the classroom, armed with ideas on how we might put together a solution to this problem. For the rest of the period, there wasn’t much beyond the sound of typing as people began working their way into the challenge. Yup. It was a Pretty Good Day. I’ve worked at four different high schools in my career as an educator, and taught computer science courses at two of them. I was the lone CS teacher at those schools, as are many of us. 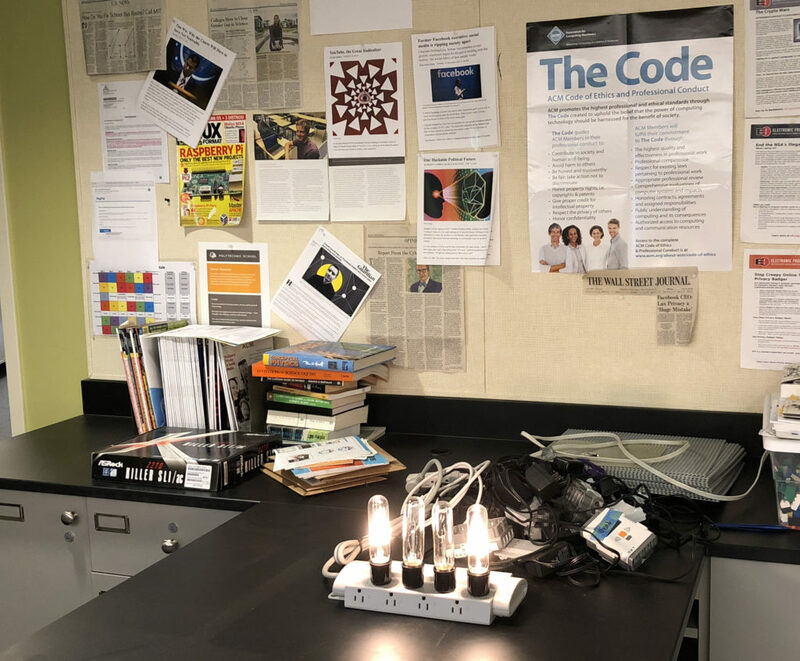 It gives us a lot of freedom in some ways, but it also makes teaching CS a bit lonely sometimes: as a science teacher, I enjoy lunchtime conversations with colleagues in that department, and benefit from having a colleague who teaches the same course I do (AP Physics C). Computer Science is different. It’s not what many teachers consider a “core competency,” I don’t have a department chair to advocate for me, and having a single teacher of that subject implies that the classes offered by the school are limited to subjects with which I have some familiarity: I am comfortable offering an Intro to Computer Science course in Python, an AP Computer Science A course, and an Advanced Topics in CS (data structures) class, but I don’t offer classes in mobile application development, networking, or game development. After several years of encouraging the school to increase the number of sections of CS offered, I am so excited that we made the decision to hire someone for a Math/CS position, and that I’ll soon have a colleague with whom I’ll be sharing CS teaching duties. It’s a time of transition for the school, and for me as well. I’ve never had a CS colleague before! The courses currently offered at the school have all been designed by me, and taught by me for so long that I suppose I might be forgiven for being a little possessive of them. And yet (at this point, anyway) I don’t feel too worried about that. It may help that I’ve seen our new hire teaching a CS class and I appreciated the way he worked with the students. Or maybe I’m just looking forward to having conversations with a colleague with whom I can discuss curriculum ideas, teaching strategies, projects, etc. This new hire is relatively young, and although he has a decent amount of experience programming in a variety of languages, this will be his first experience formally teaching CS. At this point, the challenge facing me is this: how do I share what I’ve done with these classes with the new teacher? Course calendar from last year? I’m happy to share some/all of these things, but it’s also important for a teacher to be able to develop their own materials, and find their own way of teaching a class. I’ve worked with student teachers in the past, and giving them the freedom to find their own pedagogical identity is one of my favorite parts of that experience. We’ll see how it all works out! In the meantime, I’m just so pleased that my school–a relatively small, independent institution–recognizes that providing CS experiences for as many students as possible is increasingly important.